Just pack it and go: the portable banknote counter rapidcount V30 from ratiotec is optimal for field usage and when on-the-go. 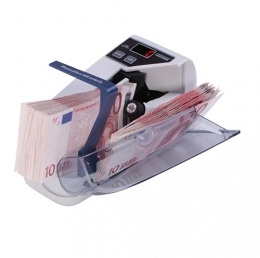 It offers extremely high performance; with 600 banknotes per minute, it keeps up with noticeably larger counters. Both the input and output hold 120 banknotes, so that even larger amounts are processed quickly. Handling is both simple and intuitive and the tallied result is digitally displayed. The V30 also quickly and reliably counts non-cash receipts, vouchers, prescriptions, etc. Weighing a mere 400 grams it may comfortably be transported in the included carrying case. Thanks to its compact measurements (approx. 19 x 10 x 7 cm) it fits nearly everywhere. An added plus is its flexibility, since the V30 banknote counter recognizes the amounts of many different currencies. With the help of the integrated addition function the counter also tallies various partial sums to reach the total sum. The clamp-on guide rail always guarantees reliable counting process.